Inlays and onlays are dental works which are bonded to the biting surfaces of your teeth. The biting surface is the one which interacts with the food whenever you bite or chew. As such, inlays and onlays carry not just an aesthetic significance but can also restore the functionality of a cavity-ridden tooth especially that of a molar. Inlays are used to refer to a dental work which covers one of the cusps, or peaks which comprise a biting surface. On the other hand, onlays are those which cover the entire biting surface of the tooth and are larger than the inlays. In general, onlays and inlays are smaller than crowns and veneers. There are two types of inlays and onlays in Atlanta GA which you may choose from — the direct and indirect. Direct inlays and onlays are made by placing the composite resin material directly on the surface of the tooth and then molding it into its final shape while it’s already adhered to the tooth. On the other hand, indirect inlays and onlays are made by fabricating the dental work first before bonding it into place. Of the two, the indirect inlays and onlays take longer to be finished because of the need to manufacture the restorations first. Direct Inlays and Onlays. Your dentist will first apply a local anesthesia to the gums close to the tooth which has to be treated. Once this is done, your dentist will then remove any decayed material still attached to the tooth. Dr. Ballard will then place a composite resin material on the tooth and then shape it. Once done, your Dr. Ballard will have to remove the resin material and place it in the oven to allow it to harden. The hardened dental work will then be cemented to the tooth. Indirect Inlays and Onlays. 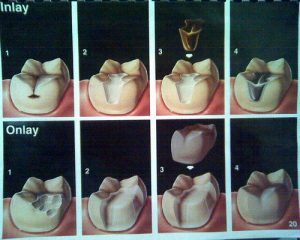 The procedure for indirect inlays and onlays is more complicated. Your dentist will first make impressions of your teeth which will be sent to the laboratory in order to be manufactured by a lab technician. Once the inlays and onlays are completed, you will be called in for a second visit to the dentist wherein the dental work will be attached to your tooth. Take note of signs of teeth sensitivity. If the sensitivity persists a couple of days after the procedure, then you might need to contact your Dr. Jeffery Ballard.